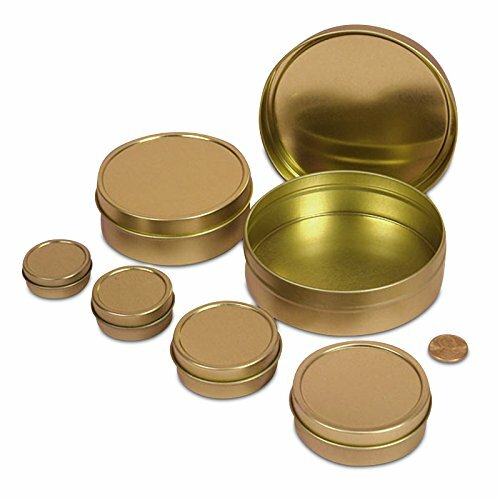 24ea - 3 Oz Gold Shallow Round Tin Can-Pkg - Gold anodized inside and outside. Shallow seamless "tin" (steel) containers with slip on covers. Price includes container and cover, which are shipped assembled. Tins have no sharp edges, all edges are rounded and are seamlessly formed from .24mm metal. Dimensions are outside measurements. Our tin cans are made of 100% steel anodized with gold coating and do not have an internal plastic lining, therefore caustic substances may cause the steel to rust. For rustproof tin cans look 513. Seal your product with Shrink Bands available in 596 or 597.Order high-quality Digital Labels customized for you! Click here.